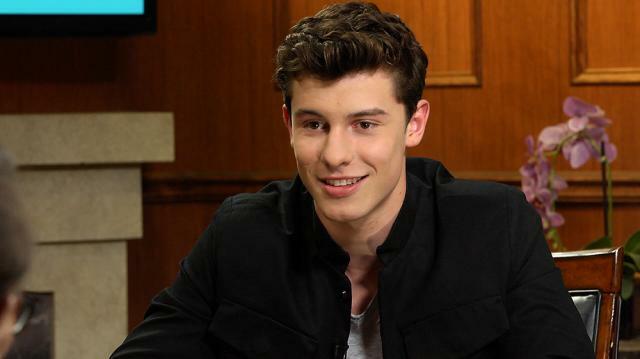 Music wunderkind Shawn Mendes dishes on a variety of topics during his visit to 'Larry King Now,' including the process behind constructing his new album 'Illuminate,' and what fans can expect from a forthcoming world tour. Plus, Shawn opens up about handling global fame at such a young age, what it was like working alongside Taylor Swift, and his next big career move. Singer-songwriter Shawn Mendes, on the cusp of releasing his new album Illuminate, embraces the new sounds and control that widespread success has allowed him to have over his music. Plus, the literally overnight sensation embraces the lessons he’s learned from working with powerhouse artists such as Taylor Swift. Shawn Mendes discusses the duality of the Internet, it can make your career, but it can break one too. The Madison Square Garden headliner also gives some insight into future aspirations, and how he stays grounded even after finding fame in such short time. Shawn Mendes proudly speaks to his new album, which he controlled as both producer and singer-songwriter. He also had more creative freedom when shooting music videos, which allowed him to embrace his other creative passion, acting. Mendes reveals his musical inspirations, the relationship he fosters with his fans, and the change from shooting viral videos to performing for a live audience. “I thought it was a cool idea to put a little cover up online. Yeah it was literally six seconds of singing. I put it up and didn’t really think much of it. Went to bed that night, woke up the next day, and it had like 2000 likes. Obviously, I freaked out and so that day I posted like six other covers. So on the page there’s this thing where when your video would get lots of like there’s this thing it would go to called the popular page. And so my cover video went to the top of this popular page and it was like by the end of the day I had like 15,000 likes along with 15,000 followers so, so to speak, it was kind of a overnight type of thing.” — Shawn Mendes on finding initial success using the app Vine. “The MSG is gonna be big. It’s gonna be cool because we’re playing a lot of the new album so the whole set is gonna be changed, the whole production. It’s all gonna be new.” – Shawn Mendes on his upcoming sold-out show at Madison Square Garden. “First time I played to an audience was this random day in Toronto where a couple people from Vine were going to Toronto to meet their fans and I said to my parents, ‘I’m gonna go to Toronto, downtown Toronto, and meet some fans. Hopefully there’s people who know me.’ And I got down there and there was like 3000 people and they immediately started mobbing me, and it was a really surreal experience. I sat down on a bench and pulled out my guitar and started singing for them. And that was like, that was the moment where it all of a sudden went from something impossible to a very tangible dream.” – Shawn Mendes on the first time he played live for an audience. “I still get nervous every show. You turn nerves into whatever that is. That performing thing that people can’t really explain.” – Shawn Mendes on stage fright.